This NYT piece from yesterday is a classic. The winter is cold and we’re seeing record snows because of … global warming. Not being a scientist, I can’t speak to the science. But the man-caused GW crowd has certainly set the table nicely on this phenomenon. If it’s abnormally hot, they say this is evidence of GW. Likewise if it rains too much or gets bitterly cold or if there are lots of hurricanes and droughts. I’ll bet there’s lots of lawyers who wish they could do that in a courtroom. Heck, even Johnny Cochran couldn’t pull that off. Terry, I too am not a scientist. But, unlike you, I am not presuming that the GW crowd is just trying to corral all facts to fit the conclusory curve ('tis the season for metaphor mixology – a bit tipsy here). Perhaps the impressive number of respected scientists are correct, and not just trying to win some stupid debate. Or blindly following Al Gore.As an aside, when we were kids there was the same kind of concentrated debate about the Population Bomb. It petered out after a few years – I guess things were not as bad as they seemed. But there was a residual value to that debate: we are far more aware of global population and birth control issues. Eh, maybe that's not a great comparison. It's clear that the majority of folks who find it hard to believe that the earth is warming due to anthropogenic causes have neither a scientific background, nor specifically a background in the earth sciences or climatology. Poo-pooing the experts who have raised the alarm of the consequences of anthropogenic global warming because we find it hard to believe in the warming of the earth while digging ourselves out from a blizzard is not unlike those who disparaged early explorers warning that they would surely sail their ships off the edge of the world.Because one cannot fathom a thing, does not necessarily mean that it doesn't exist. Didn't we almost wipe out the bald eagle in North America because of anthropogenic action? Are we humans not responsible for many other extinctions? To presume that this big, old earth (4.6 billion years for most of us; 6000 years for some unscientific biblicists), and all its creatures, is immune to our actions is foolhardy at the least. We can wipe out millions, potentially billions, with the nuclear arsenal of the US and Russia alone. We have the capacity to kill hundreds of thousands with biologic agents. We've contaminated and poisoned rivers and lakes and oceans leaving death in its wake. We almost destroyed the ozone layer because of our use of organohalogen compounds. To believe for an instant that all of the greenhouse gases we've been emitting since the industrial age would have a negligible effect on the earth is illogical, to say the least.For every alleged "expert" (probably on the payroll of big oil) who denies AGW, you can undoubtedly find a thousand who believe in the authenticity of the science. Billy and Peter,I'm not saying that AGW is a reality or not. We have had wild swings in the earth's temps and cycles of bizarre weather since before man ever existed. So the reality is that we simply don't know if we're causing this warming and extreme weather or whether it's cyclical.This post was more directed at how AGW advocates have framed the debate and how it would never be tolerated in other arenas. I have to chime in here since Billy-b posted a comment. Hi Billy. I believe that the whole global warming hysteria is a scam that is designed by the left in order to generate enough public support to impose as many guidelines and restrictions on some of the major corporations, mainly targeting the oil companies. I am by no means a proponent of the oil companies, and I am well aware of their ruthless tactics. However, if you have to fabricate yet another end of the world scenario to get the public all riled up because you’re trying to get enough leverage to gain an overwhelming advantage, then the remedy is as bad as the affliction. Another part of the same scam is the fuel cells that Fuelcell Energy produces. Anyone that knows anything about those monstrosities that they produce knows that they’re just a joke, and it’s a joke that we all have to pay for through our tax dollars. That company is nothing more than a political outlet for the Democrats, and it’s the Democrats that keep them in business by running this perpetual misrepresentation of global warming due to carbon emissions, and in exchange they execute a variety of functions that is designed to keep the Democrats in power, and I’m sure that the Democrats have a bunch of these phony companies throughout the country that have to be propped up by the government in order to exist. Weather patterns change and fluctuate through the years, and there’s plenty of evidence that shows that even though it’s a little warmer here, somewhere else in the world it’s a little colder, so it evens out. Terry, "So the reality is that we simply don't know if we're causing this warming" is an untruth insofar as the majority of climatologists (not on the dole of the likes of Exxon-Mobile) maintain that the science supports the hypothesis that the current rapid cycle of warming is, in fact, anthropogenic in nature.Politics nothwithstanding, I choose to believe science. Billy, what caused the end of the Ice Age? Not man, that's for sure. 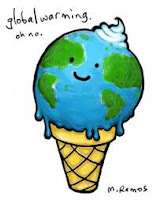 Climate scientists are postulating that, since carbon emissions have increased and carbon is a greenhouse gas and temps have risen, therefore man's greenhouse gases have caused the warming.How can we be sure that the warming we have seen over the last 20-30 years is caused by man and not some natural phenomenon such as that which ended the Ice Age? We can't, which is why I said what you quoted above.Questioning inexact science isn't telling an "untruth." It's being skeptical. Nothing wrong with that in my corner of the world. BTW BIlly, we were told in the 70s by scientists that we were entering a prolonged period of global cooling. What ever happened to that theory? they had that guy on tv,(on fox news)who predicted that in 30 years,we in Ct.would be under 4 ft of ice.Watching him squirm,evade,and outright lie was hilarious to watch.They brought out all of his scientific charts,his theories,named all of the other prominate scientists,who also had a "consenses"that we are all going to freeze to death.But instead of the oil companies as the evil bad guys,it was car companies they were after.So,these esteemed scientists came up with the catalytic converter,which took the carbon monoxide that came from cars,into carbon dioxide(CO2).Now if my memory is correct,Didn't President Obama,(another believer that all corporations are basically evil,and all their CEO's should be put in jail),claim that it was greenhouse gases that is killing poor mother earth?If that is true,all we have to do is take all those catalytic converters off our cars,and we're all saved.And has anyone noticed what a disaster ethanol is?The combustion engine was not designed to run on corn liqour.It's caused the price of food to skyrocket,forcing poor people to eat cheaper alternatives,and now we have an obesity epidemic. This whole stupid debate on global warming is all BS.We could solve the problem by building nuclear energy plants.But of course the tree huggers don't like that idea either,even though the vaunted Europeans get 70% of their energy from nuclear power.Anyone turning green in Europe?Any nuclear melt downs ala Jane Fonda?The only major nuclear accident was in Russia,because of faulty science.The Russians were using liquid metal instead of water to cool their reactors.Other than 3 mile island(where no one was killed or injured),we've never had a nuclear accident in America.Are we going to have to buy everything from those wonderful Chinese because the tree huggers think we should all eat grass,and live of the "rich? "How is anyone going to get rich if we can't build anything?How are we going to travel,or for that matter use your computer,without energy?It has to come from somewhere,unless of course you want to live like Vietnamese peasants wading aroud in buffalo manure all day. Greetings Terry, Gary, et al.One will frequently find oil industry folks perpetrating the anti-AGW claims or supporting the funding that alleges that AGW is a hoax. Yes, the earth has gone through coolings and warmings over its 4.6 billion life span. However, there is scientific consensus on the subject. NOAA states "Human activity has been increasing the concentration of greenhouse gases in the atmosphere…. Pre-industrial levels of carbon dioxide (prior to the start of the Industrial Revolution) were about 280 parts per million …, and current levels are greater than 380 ppmv and increasing at a rate of 1.9 ppm yr-1 since 2000. The global concentration of CO2 in our atmosphere today far exceeds the natural range over the last 650,000 years of 180 to 300 ppmv." Not to bore anyone with facts, this is not like the Y2K scare. This is real. But, if one chooses to rely on Fox News for their source of scientific infomation, who am I to argue with that.The world is flat.The sun revolves around the earth.Yoga is satanic. (example of lies perpetrated by religion)Happy New Year. Terrence, try to think about when this became a big deal. It was when Clinton was leaving the White House, and of course he went around doing a bunch of different things to jam up the Republicans as part of his departing procedure. My brother is about as smart as they come, well as far as the department of education goes anyway. He's a scientist with a 194 IQ. He's like a walking encyclopedia, and that's great if you don't want to look things up, you can just ask him. Don't bother to ask him for any practical information, because he doesn't have a clue, he is so stupid in so many ways that you can tell it's just a trade off, super smart here, and super stupid there. Do you want to know what he thinks about this global warming crap? The next time that I see him I’ll ask him for you, and I’ll let him recite all of the things that he has committed to memory until he gets to the punch line, which is always the same I’M NOT SURE-I DON'T KNOW. (So much for brains) For every scientist that you find to support your views on global warming I'll find one that disagrees, and will support my view. It's a political fulcrum that's all it is. If you are a liberal then you're going to support this global warming crap no matter what.Oh yea, there’s one more thing about my brother. He believes that God is a myth, but dungeons and dragons are real to life, I think he’s a wizard or something like that. Now that’s impressive! He's perfect example of what the department of education molds their people into. VRSam's a Ph.D candidate. A budding scientist. And it sounds like he has as much in common with your brother as Carl Sagan had with Carl Malden. Sounds like you're jealous, like you got the short end of the genetic stick. You must be glad the holidays are over. Relatively speaking. My brother was a PhD candidate in chemistry and physics at Texas A&M with a 194 IQ. I'll bet you Sam is as much of a subjugate of the education system as my brother is, but probably not as smart. Berkley is adjacent to San Francisco so you know what he’s going to say before he says it. Oh but you believe him, so whatever he says you will accept as the truth because you can’t reason things out for yourself. Maybe you’re an over educated idiot as well. Do you want nasty, I’ll give you nasty. Happy New Year! Hey, hey, gentlemen. I do have a delete button and am not afraid to use it. Funny how two people who've never met each other can still get personal. Thanks for stepping in, Terry. I apologize for being uncivil, and you're right. I don't know the guy, and shouldn't get into it like that.My bad. Billy, your platitudes about Fox News and the earth being flat don't exactly elevate the debate either. It's strange but this topic seems to evoke the same kinds of passions as another hot-button issue — abortion — which is why I rarely write about that subject anymore. Billy-b, Am I understanding you correctly? By implying that the San Francisco area is liberal, I’m somehow spewing hatred. Is that what you’re saying? Isn’t that kind of like our first exchange when you accused me of calling you ignorant, when I said that you are a highly intelligent individual that is ignorant of the actual mechanics of the Christian Faith? I want you to keep on doing what you do, so everyone gets to see first hand what you lefties are all about.Terrence, I’m happy that you admitted it was “your bad”, but you should’ve apologized to me not to Terry. The thing that got me was when you said, “Sam says there is no debate. GW is a fact. I believe him.” Sam is in line to get a piece of paper that proves he’s smarter that everyone else, so if Sam says there is no debate, then it has to be. Hey Billy-b isn’t that being a fanatic? You liberals have a way forcing your views on the public, and if anyone disagrees with you then you start up the smear machine. Do you remember the scarecrow in the “Wizard of Oz”? He wanted a brain, that’s all he ever wanted. In the end he didn’t get a brain, but he got a piece of paper that said he had a brain, and that’s all he got, but he was satisfied. This may be a case of art imitating life. The thoughts I’d be thinkin’, I could be another Lincoln, if I only had a brain. I'm sorry, Terry. My comments regarding Fox news are only meant to describe a well known fact that news companies owned by Rupert Murdoch are anything but unbiased. As Lindsey Buckingham sung, (Edward) "Murrow (is) Turning Over In His Grave." My comment about the "earth being flat" is not a platitude, but a reflection of the fact that throughout human history people have denied scientific truth because it conflicted with their "faith." And while at the time, some of these beliefs may have seemed plausible to the uneducated, today these same beliefs would be dismissed as ludicrous. I don't find this to be a derogatory correlation, at all. Today, there exist those who continue to believe, wholeheartedly, that the earth is 6,000 years old despite the scientific evidence to the contrary.Looking at the AGW "debate" I would disagree with VR's assertion that for every pro-AGW believing scientist, he could find one who disagrees. I believe that the consensus is more along the lines of 1000 to 1 (at a minimum).The Heartland Institute has been hosting anti-AGW conferences for the past 3 years. They are funded by conservative foundations, as well as Exxon-Mobile. Heartland Institute partnered with Phillip Morris in the '90's to dispute the health risks associated with second-hand smoke.Clearly, some of the folks in the anti-AGW camp have motives that are questionable. I would maintain that Exxon-Mobile, by supporting Heartland Institute, and Heartland Institute by taking money from Exxon-Mobile, lose credibility for their purported science on AGW.VR/GC: I understand that you hold "Liberals" and "Lefties" in contempt. "You liberals have a way forcing your views on the public, and if anyone disagrees with you then you start up the smear machine." I assert that the same holds true for the extreme right. Again, the same point that Eli Weisel has made.While there are areas where I do hold more leftward leanings, there are also areas in which I have somewhat conservative leanings. My issue with the current "debate" on AGW is that it has been taken over by those who are threatened by change, particularly change from a fossil fuel based civilization (and all of the profit to be made from drilling and polluting), instead of being a debate made solely by scientific experts. One can deny that there is scientific consensus on AGW. However, the truth is that more than 10,000 peer reviewed climate scientists believe that the evidence supports AGW compared to a significantly fewer (somewhere in the range of 23) who oppose the current consensus. Hello Terry. I agree with most of the things you state here. not every phenomenon can be explained with the global warning argument.